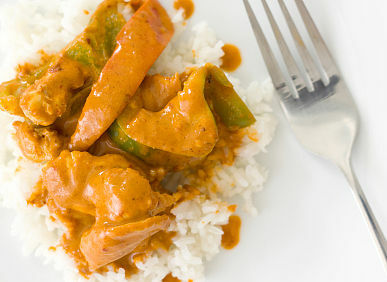 Rich Panang Peanut Curry Sauce in a Coconut Milk base. Good on everything! Into a medium saucepan empty the contents of: One can of coconut milk and bring slowly to almost-a-simmer over medium heat. Do not boil, as this will cause the thick milk to separate and thin out. And just a little fresh garlic - 1/4 teaspoon or less. If using an unsweetened natural peanut butter, you will want to add an additional Tablespoon of brown sugar or the traditional Thai Coconut Palm Sugar. Taste the sauce after the sugar is dissolved and sweeten if needed. Take care with the Curry, the Curry taste and heat take about 10 minutes to fully develop - don’t add too much right off the bat. REMOVE from heat as it starts to bubble, let burner cool down to Low and return to burner to keep piping hot. Stir occasionally to keep from sticking or burning. Serve over any stir fried or steamed vegetable, rice, rice noodle, etc. Best if topped with crushed peanuts, Cilantro or finely sliced Basil leaves and a squirt of fresh lime juice. There do exist canned Thai sauces similar to this, but they all have too much sugar and almost always have MSG. We usually use this over stir-fried vegetables; Stir-fry your vegetables with as little oil as possible, over high heat and quickly. Return everything to wok, over medium high, and add some of the sauce and stir to coat everything lightly. Place remaining sauce on table in case anyone wants a bit more. Serving Suggestion: Slice and sauté some sweet onions in frying pan with a little garlic, fresh grated ginger and a Tablespoon or so of peanut or coconut oil, after they have cooked down a little, add sliced cabbage and fresh spinach, toss, add a tablespoon of water, cover and steam until it is just barely wilted. Serve plain in bowl or over rice, or rice vermicelli. Top with Peanut Curry Sauce, crushed peanuts, and cilantro.